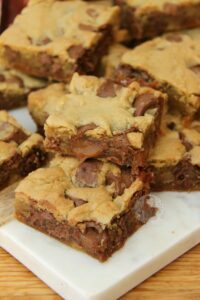 Delicious Chocolate Chip Rolo Cookie Bars that Everyone will Love – Delicious Cookie, Chocolate Chips, and Oooodles of Rolos! The other week I posted a recipe for some DELICIOUS M&M Cookie Bars and oh my days I adore them so much. Like, I’ve made them 7 times now, and so many of you guys have already made them too. However, one of my regular readers sent me a link to this delicious recipe by Averie Cooks and it inspired me. 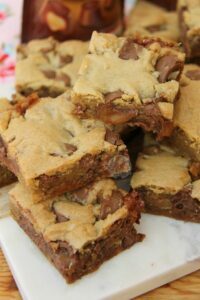 I seriously HAD to make a Rolo version of the Cookie Bars immediately. I wasn’t really keen on going on the Blondie root for the recipe as I posted my recipe for my White Chocolate & Pistachio Blondies recently, but as I only have one Cookie Bar recipe so far, this had to happen. I also wanted to make a slight change and not make it a double chocolate style recipe, and more of a plain cookie! I tried to just remove the 50g Cocoa Powder and add in 50g of Plain Flour but the dough seemed quite wet still, so adding in an extra 25g of flour worked perfectly! If you do want it to be double chocolatey however, do as the M&M Cookie Bars recipe says! 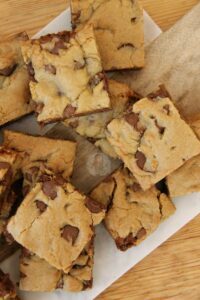 These delicious bars are super gooey cookie style, like these aren’t a crunchy Cookie by any means.. They can be if you like, but you’ll have to bake them for a lot longer, and then the caramel might go a bit dodgy. 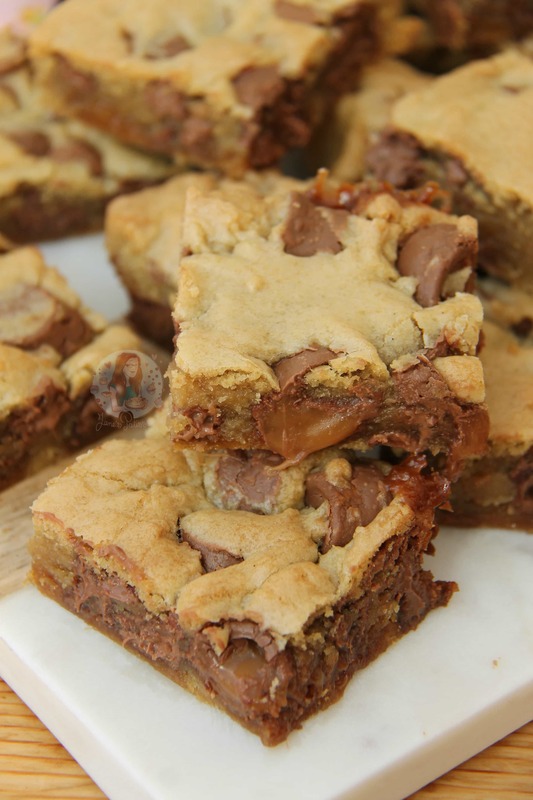 The caramel in the Rolos makes the cookie bars softer and sweeter, whilst also still having little pockets of Caramel throughout. Adding in a smaller amount of Chocolate Chips gives it that extra hit of chocolateyness that I crave! You could easily use the Dark Chocolate R0los if you prefer, or use White or Dark Chocolate Chips… but Milk is my fave! After the success of my other Rolo recipes such as my No-Bake Caramel Rolo Cheesecake and No-Bake Rolo Tart I knew you would appreciate this as well. I might have been slightly inspired to do this as well because my new Puppy is called Rolo, so I say Rolo multiple times a day now so it’s all I can think about.. my bad. But hey, they’re delicious! I hope you guys love these as much as my Trusty Taste Testers and I did! Enjoy! This recipe makes 16 Cookie Bars! 1) Preheat your oven to 190C/170C Fan and line a 9x9inch Square Tin with parchment paper, and leave to the side for now. 2) Whisk/Mix the Plain Flour, Bicarbonate, Salt and Cornflour together so its evenly distributed – leave to the side. 4) Add in the Dry Ingredients, the Rolos (apart from a handful), and the Chocolate Chips and mix with a spatula till a thick cookie dough is formed. 5) Press the mixture into the bottom of the tin and press in the handful of Rolos into the top for decoration. 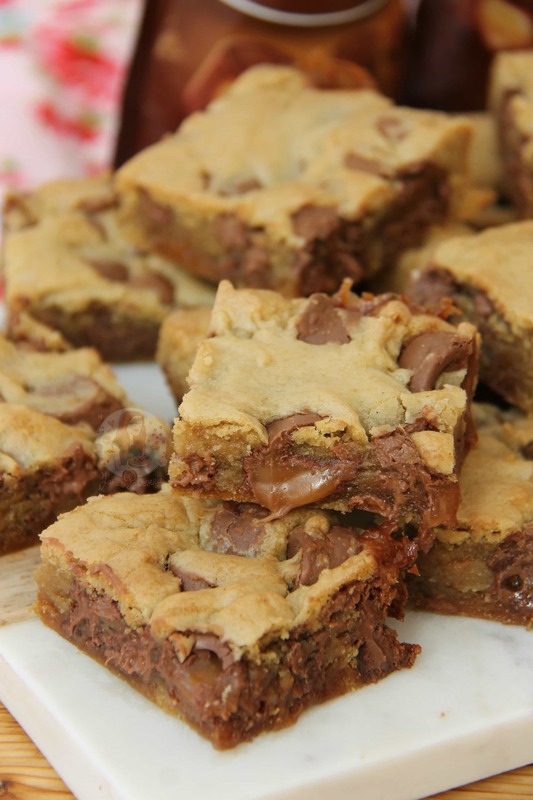 Bake the traybake in the oven for 25-30 minutes, until the top of the cookie bake looks ‘dry’! 6) Leave the cookie bake to cool for about 10 minutes, then leave to cool fully on a wire rack. Cut the bake into 4×4 for decent sizes, or 5×5 for smaller ones! Enjoy! If you can’t access Rolos, you could use something that is a soft caramel like pieces of Cadburys Caramel maybe? I wouldn’t suggest using a hard caramel sweet however as it will bake differently. You could also use something such as Munchies! I’ve never personally tried this mix as an actual cookie, but if you try it out, let me know how you get on – I’d love to know if it worked! Find my other Cookie & Traybake Recipes on my Recipes Page! Older Next post: Peanut Butter Fudge! Newer Previous post: No-Bake Bounty Cheesecake! I’m thinking of baking these but I don’t have the correct baking tray, I do however have a foil roasting tray (one of the disposable ones. Do you think it would work similarly if I were to use the disposable tray? Thanks in advance. Btw I literally will go nowhere else for recipes after I found this page! Yes they should be fine! Obviously is the volume sizing of the trays is different the traybake may take different times to bake, but it should work fine! I made these a few weeks ago and they were amazing! I definitely didn’t save enough to put on top though! I made these the other day and they were so tasty!! The only thing is mine came out a bit dry and crunchy. I have a gas oven so not sure if I did the conversion wrong. What temperature would you recommend for gas and do you think I should alter the cooking time? Just made these, smell delicious (I’m diary free as I’m breastfeeding a newborn with a cows milk allergy) so I haven’t tried them. However when I’ve tried to cut them they are just very gooey…🤔 have I cooked them too high or shall I leave out some Rolos next time or more flour? Recipe looks delicious!!!! I can’t wait to try this!!!! I tried your brownies the other day so if this is anything to go by it’s going to be a winner!!!! Made these yesterday, they were absolutely delicious (all gone already). Tried a couple of shops and couldn’t get Rolos so we resorted to getting a bar of dairy milk caramel and using the squares of that instead. It turned out lovely- especially when still warm with a dollop of ice cream! Hi how many rolos do I add in ?? The amount is listed in the ingredients. When it comes to the vanilla extract, can I use the vanilla paste instead? I’ve never heard of ‘corn flour ‘. I’m sure it’s not cornmeal. Can I just use an extra tablespoon of plain flour or is it the same as cornstarch??! In the oven baking now & smell amazing ! Can not wait to try ! Hi Jane, I made these and the first time they came out great. However, since then, the cookie mixture has seemed less dry and gloopier resulting in a rock hard tray of cookie bars. What am I doing wrong? 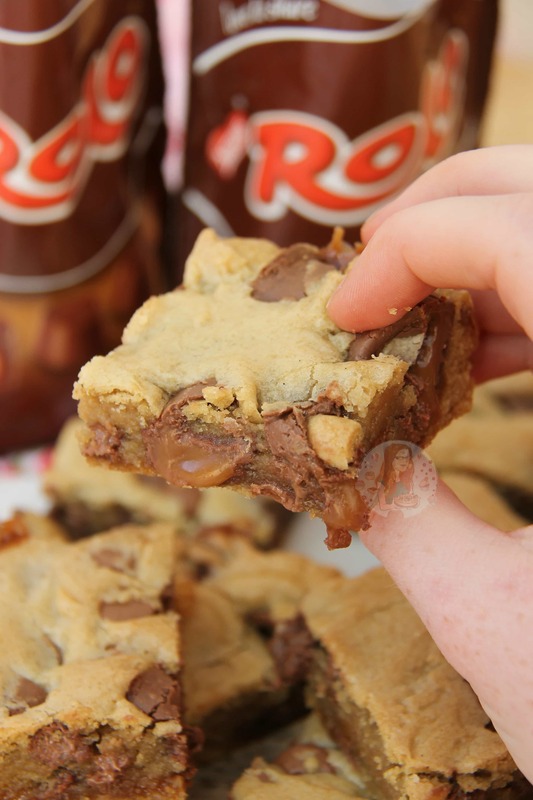 It might be that more of the rolos have broken in the cookie dough, so its baking differently. Carefully mix them in instead, and it should be fine. Made these for my daughter and son-in-law, received a text saying, what are they called? We’re eating them all! Doesn’t look like they’ll be any left for work tomorrow then ? I made these today with my daughter and they turned out perfectly. Thank you. I made these bars today for my 12 year old and he liked them a lot, thank you for sharing! – I like that I have to weight the ingredients, I think it’s more accurate. Oooh that’s amazing! I’m so glad! Oh my gosh. I hope these taste as good as they look! I can’t wait to try them! Awh thank you! And I can assure you they do!! Dayummmmm that Rolo caramel ooze though. These look so good! Hahah oh I know, I was so satisfied with the photos of that caramel! Thank you! Yummy! You gave me the right recipe for the dessert to offer to my friends at our Lady Bunco Night… I’m sure it will be a success! Thanks for sharing!